Before going to Greece, the only thing I knew how to say was “sagapo” (I love you). Now, that didn’t serve me well during my trip to this beautiful country, but I was determined to learn more. Lucky for me, my friends had just finished up their study abroad semester in Athens which, of course, meant that I’d learn everything they learned… or so I thought. My Greek vocabulary increased by just two phrases….”ohi” (no) and “étsi ki étsi” (so-so, or to my friends, it meant sketchy … not the literal translation, but they made their own interpretation of it). I guess you could say, it was not a success in the learning Greek department, but it was in other ways. Ancient ruins and beautiful islands decorate this great country. The Parthenon sits atop, what seems like a gigantic hill. And it cetrainly feels like it when you’re trekking up to see its glorious ruins. We took a ferry over to Mykonos after a couple days in Athens and, oh my, was it breathtaking. Picturesque houses give so much personality to an already gorgeous island. It was hard to believe my eyes. That royal blue sticks out as its national color and it’s absolutely apparent on this little island. But my favorite thing, you ask? The food, of course! I tried saganaki for the first time and haven’t had anything similar here in the States. It was an experience that I won’t forget: from the fire used to beautifully burn the cheese to its crispy, savory, and tangy taste. It’s a must! But the best thing I ate was souvlaki (Greek-style kebob). It’s commonly sold as street food in Greece and it’s to die for. Juicy. lemony. oregano-y. The meat is seasoned and cooked to perfection and best of all? Easy to transport since it’s sold on a stick. 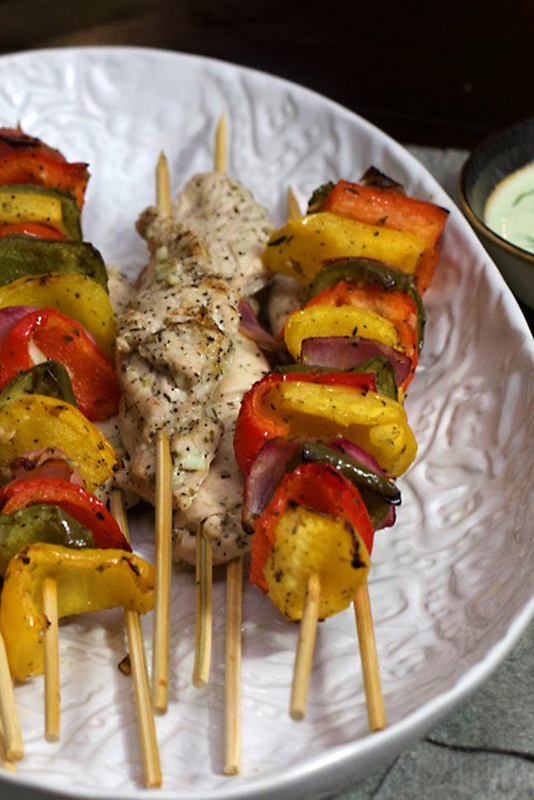 These flavorful Greek kabobs will add some new flavors into your life. And for all my vegans, you can easily switch out chicken for a little zucchini. Cut chicken breasts (or zucchini), vertically, into strips about 2 inches wide. Mince garlic and put in a large ziplock bag, along with chicken, spices, lemon juice, and olive oil. Mix around ingredients in the bag as to ensure that each piece of chicken is covered. Marinade in fridge for at least 30 minutes. While that’s marinating, put 16 kebab sticks (for veggie and chicken) into a bowl filled with water. The bowl should be wide enough to fit the majority of the sticks Let sit for 15 minutes. Cut bell peppers and onions into large chunks, about 1.5 inches wide x 1/5 inches wide. Mince garlic and put into a second large ziplock bag, along with vegetable chunks, spices, lemon juice, and olive oil. Mix around ingredients in the bag as to ensure that veggies are covered. Marinade in fridge for at least 30 minutes. Once done marinating, thread 8 kebab sticks into each chicken strip one by one and place them on lined cookie sheet. If they don’t all fit, just do a second round. Pour leftover marinade on top of chicken. Alternating by vegetable, assemble the veggie kebabs. Then place them on the second lined cookie sheet. Again, they may not all fit. Just bake a second round – trust me, you’ll want leftovers of this! Pour leftover marinade on top of veggies. Serve together or eat separately. Dip in tzatziki sauce for extra flavor. Check out my dairy free version (see recipe notes). If you’re making this vegan-style, I suggest eating it with a side of brown rice and replacing the chicken with zucchini. 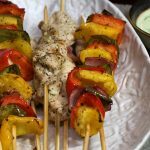 [wpurp-searchable-recipe]Chicken + Veggie Souvlaki – These flavorful Greek kabobs will add some new flavors into your life. And for all my vegans, you can easily switch out chicken for a little zucchini. – Chicken souvlaki: organic chicken breasts, lemon pepper, black pepper, himalayan pink salt, dried oregano, dried thyme, dried basil, garlic, olive oil, lemon (juice only), wooden kebab sticks, Veggie souvlaki: red bell peppers, green bell peppers, yellow bell peppers, red onion, garlic, himalayan pink salt, dried oregano, black pepper, lemon pepper, dried thyme, dried basil, olive oil, lemon (juice only), wooden kebab sticks, , Chicken souvlaki: Cut chicken breasts (or zucchini), vertically, into strips about 2 inches wide. ; Mince garlic and put in a large ziplock bag, along with chicken, spices, lemon juice, and olive oil. Mix around ingredients in the bag as to ensure that each piece of chicken is covered. Marinade in fridge for at least 30 minutes. ; While that's marinating, put 16 kebab sticks (for veggie and chicken) into a bowl filled with water. The bowl should be wide enough to fit the majority of the sticks Let sit for 15 minutes. ; Veggie souvlaki: Cut bell peppers and onions into large chunks, about 1.5 inches wide x 1/5 inches wide. ; Mince garlic and put into a second large ziplock bag, along with vegetable chunks, spices, lemon juice, and olive oil. Mix around ingredients in the bag as to ensure that veggies are covered. Marinade in fridge for at least 30 minutes. ; Preheat oven to 400 degrees. ; Line two cookie sheets with parchment paper. ; Assemble + bake souvlaki: Once done marinating, thread 8 kebab sticks into each chicken strip one by one and place them on lined cookie sheet. If they don't all fit, just do a second round. ; Pour leftover marinade on top of chicken. ; Alternating by vegetable, assemble the veggie kebabs. Then place them on the second lined cookie sheet. Again, they may not all fit. Just bake a second round – trust me, you'll want leftovers of this! ; Pour leftover marinade on top of veggies. ; Bake in oven for 15 minutes (chicken) and 10 minutes (veggies); Serve together or eat separately. Dip in tzatziki sauce for extra flavor. Check out my dairy free version (see recipe notes). ; ; – Use organic ingredients whenever possible. If you're making this vegan-style, I suggest eating it with a side of brown rice and replacing the chicken with zucchini.